Sylvain Perier, known as SP38, is a French painter, street artist, billsticker and performer. 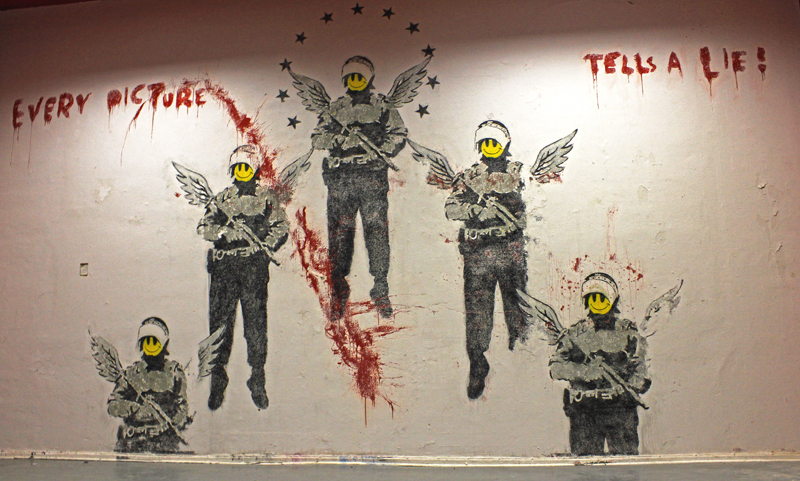 Being an international figure of street art, he has produced artistic works in many countries. squats like rue du Dragon, rue Blanche, Grange aux Belles and others. He was part of Zen Copyright, an underground artistic performance group, co-founded with Ed Neant. 2000, Nuklé-Art, Banlieue-Banlieue and more. In 1987, he participated in the exhibition „Free Art, l’année Beaubourg“ at a Free-Time in Paris, which was organized to mark the tenth anniversary of Centre Pompidou, with Monique Peytral, Jean Starck, Robert Combas, Miss Tic, Jérôme Mesnager, Jef Aérosol, les VLP and others. 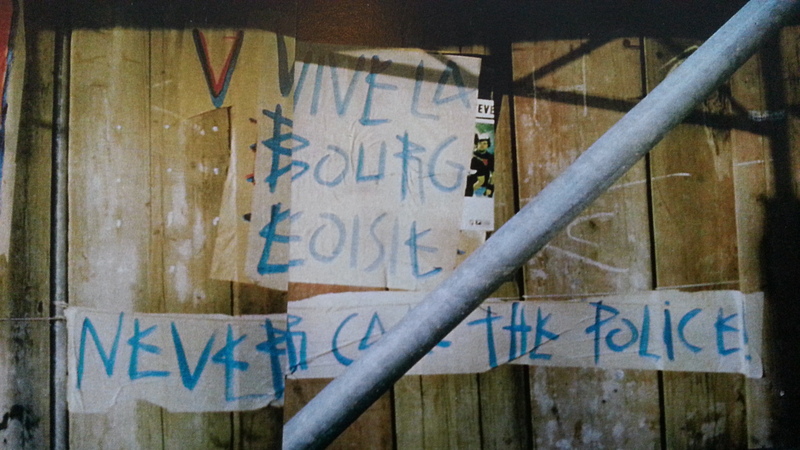 SP38 has performed frequently in rue Dénoyez, Paris, painting and putting-up posters on the walls in Belleville’s neighborhood. His works have been exhibited at the Frichez-nous la Paix Gallery. Until the gallery shut down in June 2015, he remained highly invested in this location. 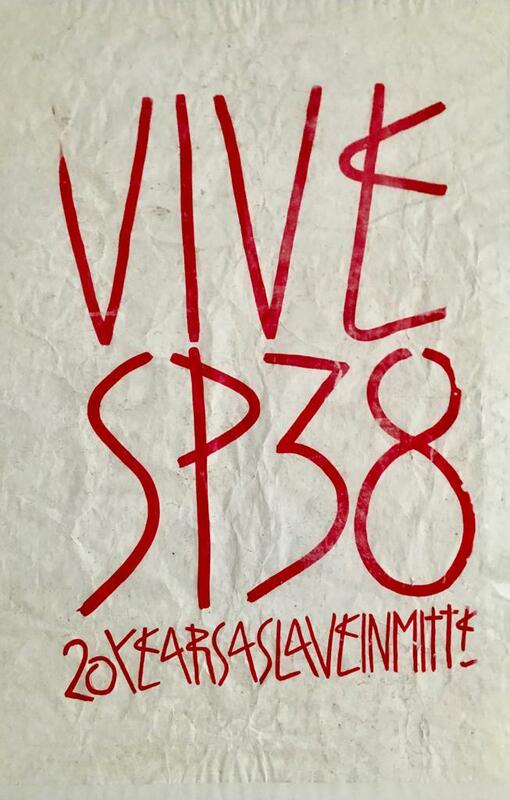 Since 2008, SP 38 has been active for the „Instin“ literary and artistic adventure, initiated in 1997 by the French writer Patrick Chatelier, by sticking his „INSTIN“posters all over the world. In August 1995, SP moved to Berlin (Germany), which to him „represented the place where everything was made possible for the street art movement“. He joined German artistic squats like Tacheles, Acud, Prora in Rügen, Blühende Landschaften Gallery and Stattbad Wedding. SP 38 is living between Berlin, Paris and Seoul (Korea) and traveling the world, attending exhibitions, live painting performances and displaying his stickers and posters in urban space. SP38 began 1995 – living at Tacheles – to carry its first works from there into the streets of Berlin. 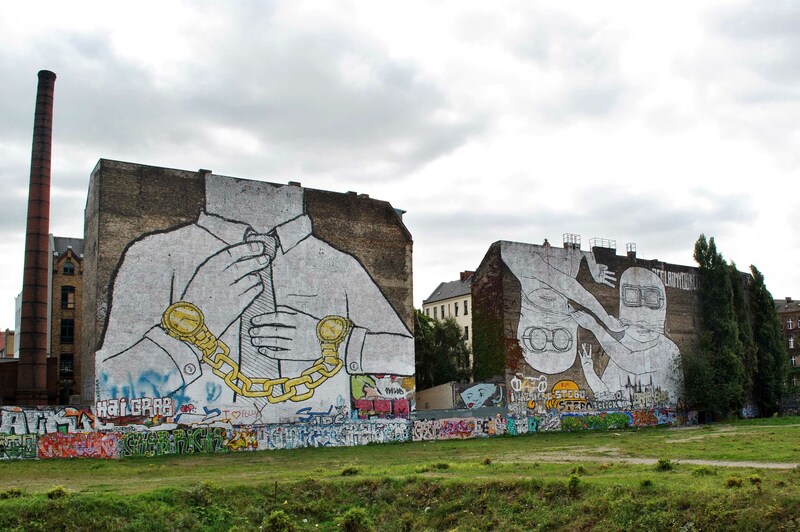 Sometimes together with the 6en-Maler, the painter of 6, Rainer Brendel, they installed their art all around Tacheles in Berlin-Mitte and shaped the streets of this district next to graffiti pieces and political slogans. At that time SP38 was one of the first street artists in Berlin to paste paper works in the streets. His trademark is his recurring typography and his short concise slogans and composed words in English or French that transport certain themes. Often his words/slogans show unusual upheavals in order to achieve harmony and balance among the letters on the rectangular format of the paper. Written in one color (red, blue, green, pink or gold), his large narrow letters are painted with brushes à main levée on white paper in poster formats, and then reproduced by hand or by silkscreen. They are then placed in roofed places on streets, as series for new editions, like an ad campaign, mostly in Berlin-Mitte, his „plaster“ since 1995. SP38 addresses socialpolitical themes in a reduced and playful way with slogans or new word combinations, mostly with poetic ironic „détournement“. Like in Vive la crise, long live the crisis, as a response to the economic crisis. Vive la Bourgeoisie is an ironic expression of the partly hated conservative bourgeoisie, dominant in his home country France. I don’t want to be your friend on facebook, as a former expression of skepticism towards the mega corporate Facebook is still pasting in the entrance of Haus Schwarzenberg. The paste up Escape recalls the getaway from East to West in Berlin or the need today, to escape from the rapidly changing German capital. 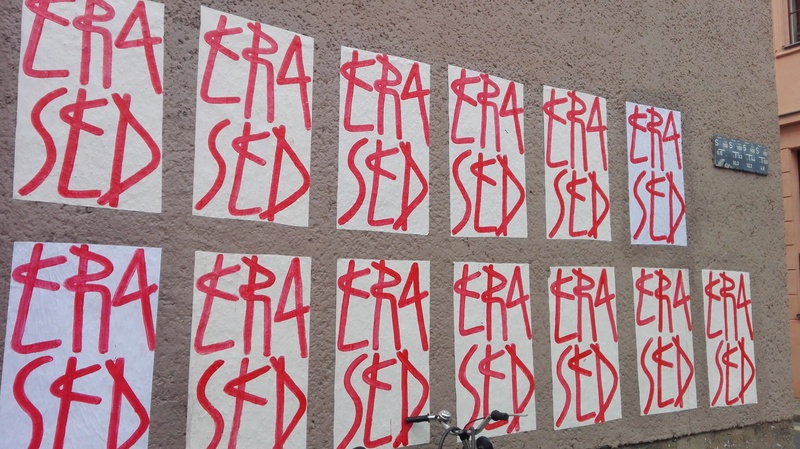 Erased (withs since 2016) serves as a catchword of gentrification, it is placed by SP38 since years in threatened or gentrified neighborhoods. 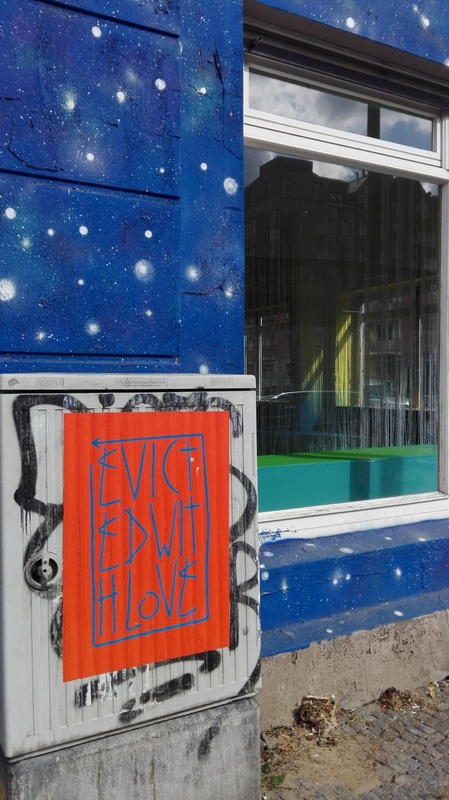 Evicted with love (2017) is a oxymoron and an innuendo, it reminds evictions in Berlin and personal memories of the artist. 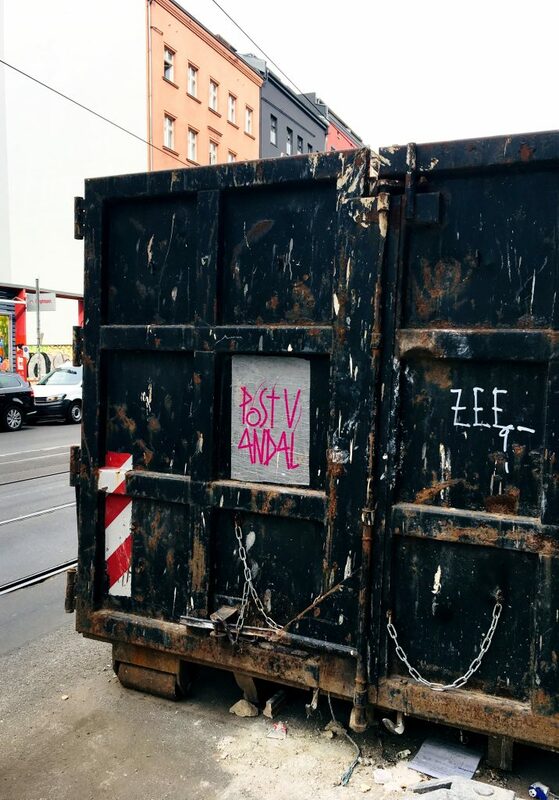 Post Vandal (2018) is the word result of his reflection on today’s graffiti and street art business and its inaccurate definitions and categorizations. 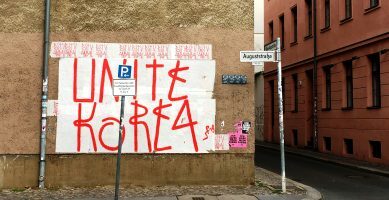 The work Unite Korea (2018) is a direct appeal to the country of Korea to unite, here in Berlin glued to the wall in a large format, reminiscent of the division and reunification of Germany, it is spanning an arc between the history of both countries. SP38 manages again and again to surprise with its creative and playful choice of words, full of irony or even sarcasm, and to stimulate reflection on social phenomena and sociopolitical subjects. He has now worked for more than 25 years on paper, doing affichage/paste ups as well as live paintings, murals and canvases. 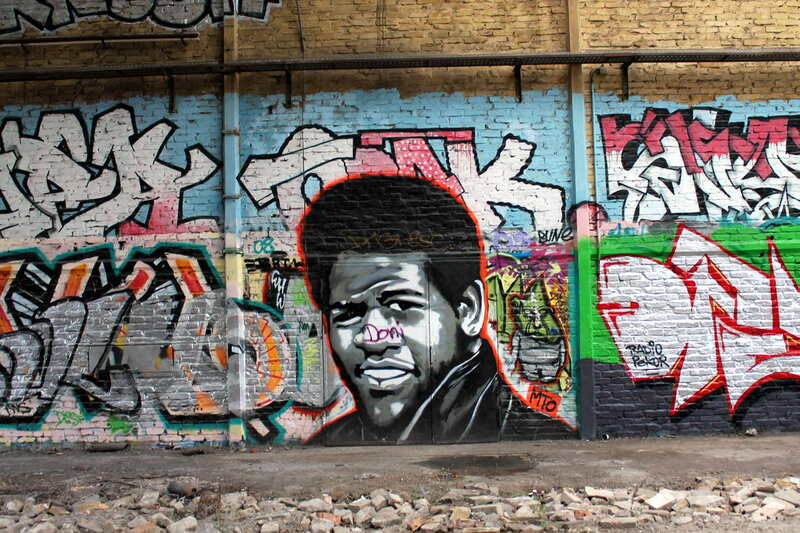 He remains one of Berlin’s longstanding active and indefatigable street artist.